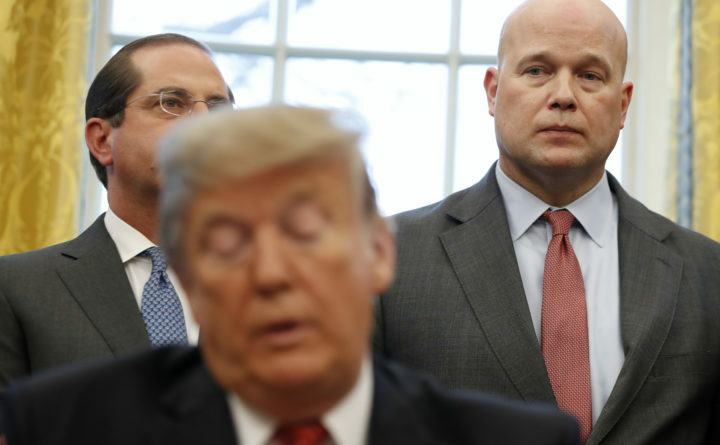 Acting Attorney General Matt Whitaker, right, listens as President Donald Trump speaks to the media before signing anti-human trafficking legislation on Wednesday in the Oval Office of the White House in Washington. At back left is Health and Human Services Secretary Alex Azar. WASHINGTON — The Supreme Court, without comment, turned away a challenge Monday to Matt Whitaker’s appointment as acting attorney general. Washington lawyer and Supreme Court practitioner Thomas Goldstein has intervened in cases in Nevada and Maryland to say that President Donald Trump did not have the legal authority to appoint Whitaker, who had served as chief of staff to former attorney general Jeff Sessions. The justices denied the Nevada case and its attempt to substitute Deputy Attorney General Rod Rosenstein for Whitaker. The Maryland case is still before a federal judge there. Goldstein and others say that Rosenstein, the department’s number two official, should have succeeded Sessions, and that it is unlawful for Whitaker to be running the department for even a short time. They brought the issue to the Supreme Court in a case brought by Barry Michaels. He was challenging a law that prevents him from buying a firearm because of a previous nonviolent crime. Maryland Attorney General Brian Frosh, in coordination with Goldstein, has also challenged the validity of Whitaker’s appointment in a pending case in federal court in Baltimore. U.S. District Judge Ellen Hollander has not yet ruled on the state’s motion to replace Whitaker with Rosenstein. The lawsuit seeks to force the Trump administration to uphold a key section of the Affordable Care Act. Hollander has not said when she would issue a decision, but the court’s action will surely affect her decision. Since the filings, Trump has nominated William Barr to replace Sessions as attorney general. His confirmation hearings in the Senate are scheduled to begin soon. Washington Post writer Ann E. Marimow contributed to this report.